I love baking in stages. It means less hassle, a controlled pile of dishes and more time to watch 30 Rock, the latter I am currently obsessed with. Yesterday morning I dragged myself out of bed, heated up the oven and began slicing and baking cookies alongside several cups of coffee and watching Tina Fey be wonderful consistently over a 20 minute period. 6am cookie bakes will change your life I tell ya. I made these jewelled beauties for my first baking club meet for Pinnies and Petticoats. I will be covering it for work, so won’t mention too much on here, but it’s so lovely to see other passionate bakers in Aberdeen come together for a cuppa, a chat and a slice of cake. The brief this month was Valentine’s Day and after a long sift through my stash of cookery books and February Delicious magazines, I settled on this studded dough filled with gorgeous goodness. Similar to shortbread rather than a traditional chewy cookie, these slice and bake-em-up’s use icing sugar for a perfect crumble-texture that carries flavour beautifully. 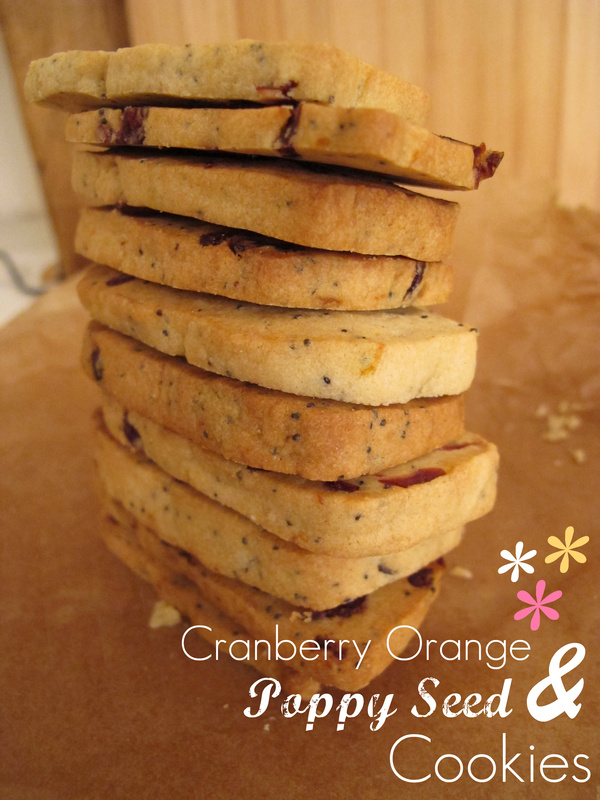 With a burst of sour cranberries, zesty orange and blue-ish flecks of poppy seed, these biscuits are a perfect present idea for the one you love. 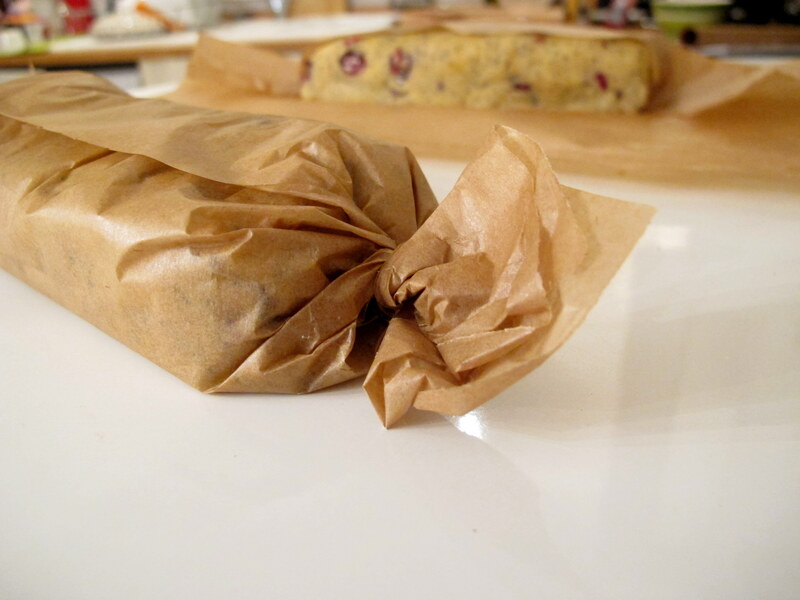 Bake and wrap or hand over chilled in baking parchment and spread the slice n bake love. This dough can be whipped up in a good 20 minutes, rolled up into tasty cookie dough crackers and chilled overnight. Wipe down surfaces, have a glass of wine then bake when the heck you like. You could freeze this dough easily, then slice as required. Cookies on demand, I like that idea. In a stand mixer, beat the softened butter and sugar together until creamy. Add the eggs and vanilla paste and beat again until smooth. You may need to scrape the sides and beat again to get the mixture consistent. 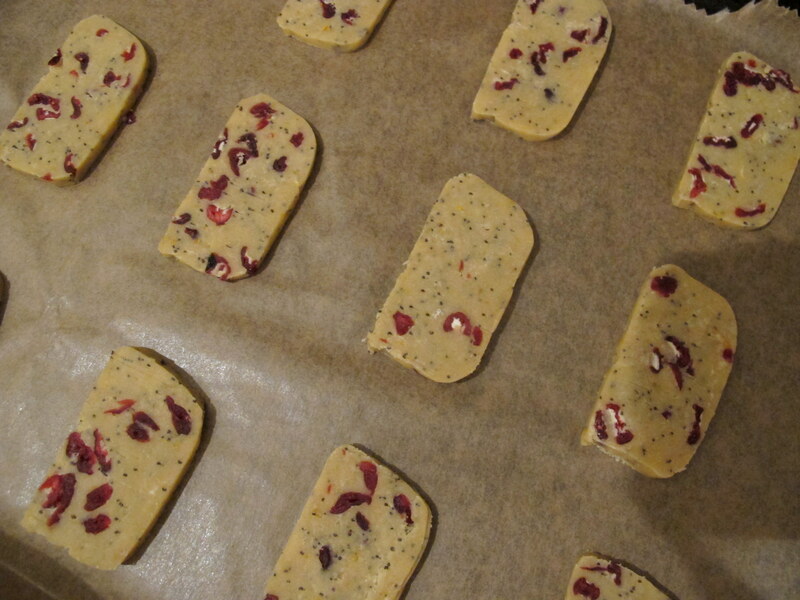 Add the flour, salt, cranberries, orange zest and poppy seeds and using the fold setting (or a low speed) and mix until just combined then bring together with your hands. Separate the dough and split between two sheets of baking parchment. 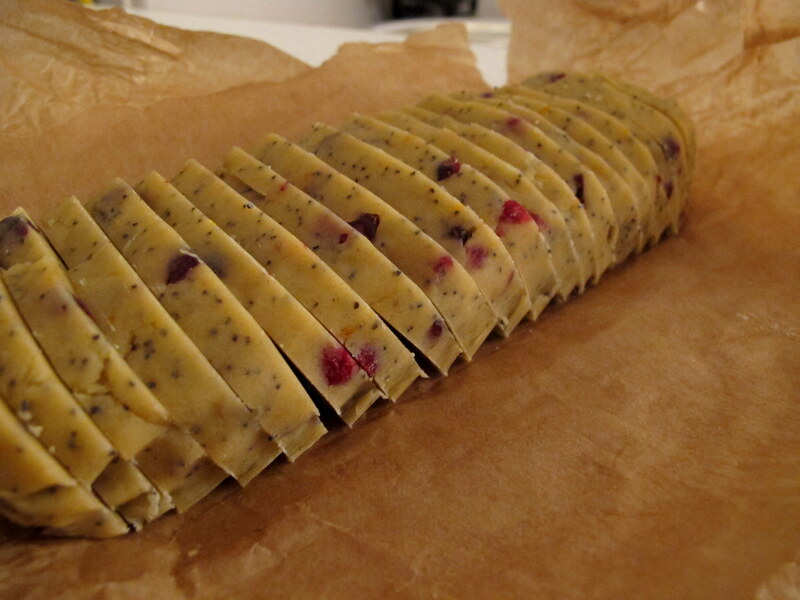 Press into an oblong shape 1 inch wide then wrap tightly and refrigerate. Leave to chill for at least 3 hours but overnight works best. When ready to bake, preheat the oven to 180oc/160oc fan/Gas Mark 4 and line a baking tray with baking parchment. Remove the cookie logs from the fridge and slice to the thickness of 2 pound coins. Line the tray with 12 cookies, spaced an inch apart. Bake in batches for 10-15 minutes until lightly golden around the edges then leave to cool for five minutes on the tray before transferring to a wire rack to cool completely. I always have some sort of cookie dough in the freezer to bake on demand – it’s a must! I love the shape of these – nice change from round.